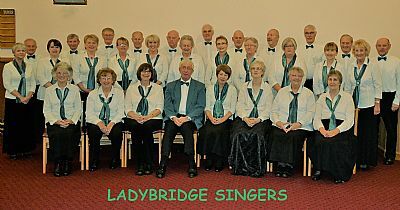 Ladybridge Singers have been entertaining in the Bolton and South East Lancashire area for over 40 years. In 1972, at a new housing estate in Bolton, an enthusiastic group of neighbours, met in each others homes to sing choral music, and we developed from there. Now a well known group of some 40 mixed voices, we have a wide ranging music repertoire. Led by our experienced and talented Musical Director, Dr Robert Aston, we perform everything from sacred and classical music, popular songs, to Songs from the Shows and Music Hall. We provide varied and enjoyable entertainment for both lovers of choral music, and those who prefer more popular items. Our fees are moderate, and enable good fund raising opportunities for many organisations. In addition to concerts, we can provide after-dinner entertainment. attend weddings and will consider any other type of engagement. We regularly welcome new singers who wish to join us.